The Annual Nisei Week Car show is this Friday August 15th from 11-6pm, admission is $12 at the door and kids under 10 are free. 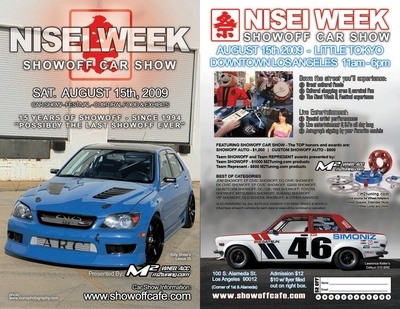 "The nation's premiere import car show hits Southern California on the 10th Annual Nisei Week Showoff Car Show, where the import car show meets cultural experience in Downtown Los Angeles. Mainstream Productions presents the Nisei Week Showoff Car Show to be held at Little Tokyo on Saturday, August 15, 2009. This is the place where the top-notch show cars come out to compete and show. SHOWOFF CAR SHOW - West coast's top show cars compete for cash prizes and trophies. This is the place where function, quality, and form counts. Overall Winner wins $1000.00 and 6ft trophy with all bragging rights. Custom Showoff (runner up) receives $500 and 5 ft trophy. We have over 350 of the finest show cars so don't miss out! LIVE ENTERTAINMENT - An all day array of stage acts including Hip Hop, R&B and bands. PLUS! To tease the eye some of the hottest industry models with their hot autographed posters and much more. NISEI WEEK FESTIVAL - Come get a taste of Japan happening at various spots throughout Little Tokyo, Carnival, food, shopping and more!"